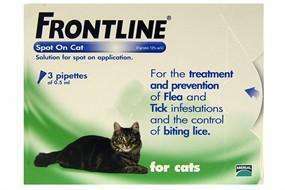 Frontline Spot-On Cat (6 pipettes) £17 delivered at animed direct..
Quick delivery (3 days delivered to me from when my order was placed) and they email you when dispatched. Can use paypal for peace of mind. I checked with the manufacturer last year as the Frontline I bought in Asda wasn't working. They said it is not as effective as Frontline Combo (which you do need a prescription for). This leads me to ask why they are allowed to sell something which doesn't work? Either way it is not cheap - but I decided I had no choice other than to buy the more expensive version (which does work). I checked with the manufacturer last year as the Frontline I bought in … I checked with the manufacturer last year as the Frontline I bought in Asda wasn't working. They said it is not as effective as Frontline Combo (which you do need a prescription for). This leads me to ask why they are allowed to sell something which doesn't work? Either way it is not cheap - but I decided I had no choice other than to buy the more expensive version (which does work). It has always worked on my cats without needing the prescription stuff so each to their own i guess. Frontline Combo is better. Sadly you can only buy it from vets or online … Frontline Combo is better. Sadly you can only buy it from vets or online if you have a prescription. You can actually buy a lot of prescription pet medicine online. They usually make you fill out a form asking you questions about your pet and approve your order based on that (that is a registered vet is essentially checking, writing and filling a prescription in one swoop). That's what's happened when I've bought stronger (prescription-only) flea treatments online before. On topic, Frontline basic is crap. Not as bad as Billy-Bob Martin Yokel Flea Moonshine (which just seemed to make the fleas more violent) but close. We've had good experience with Program when Frontline and Advantage just didn't work. Capstar is good for the first couple of days too. Kills anything that bites them but only lasts for ~24 hours. Flea management isn't just about what you put on the animal, you have to clean the house too. Wash their beds, hoover every nook and crannie and spray as much as you can with something like Indorex. If you don't, as soon as the pet-based treatment wears off, they start getting bitten. And flea collars are often an irritant to cats and are rarely strong enough to have any effect. Don't buy them.